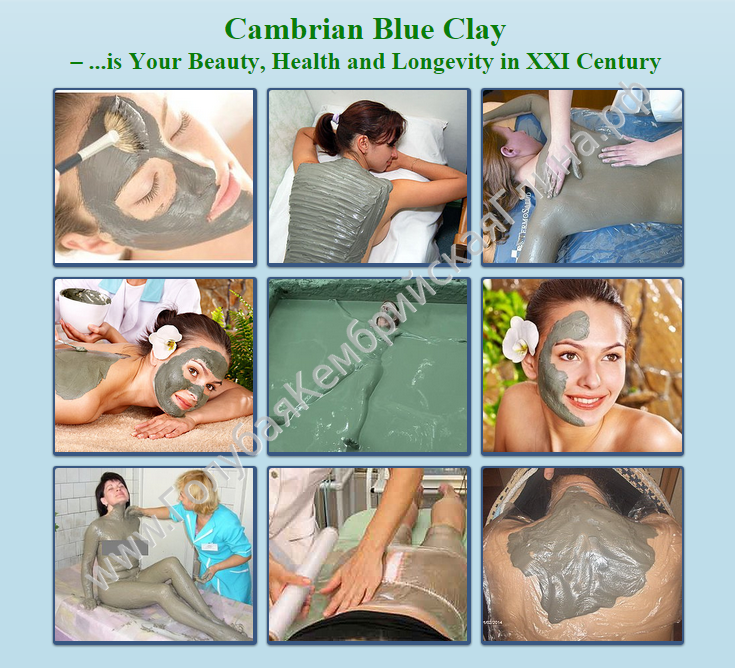 "CAMBRIAN BLUE CLAY - IS ONE OF THE BEST KEPT BEAUTY AND MEDICAL SECRETS OF THE MODERN WORLD…"
Cambrian Blue Clay (from Leningrad region)– is considered to be the oldest blue clay on the planet. This clay has a Rich&Unique mineral composition, and possesses very powefrul "Medical and Cosmetic Properties". From the ancient times people knew that blue clay doesn’t contain any bacteria. It absorbs all liquids and gaseous toxins, smells, gases and kills microbes. Absolutely everyone can be treated by the cambrian blue clay independently on the diagnosis - as it is a natural high-performance curative measure that brings the metabolic processes to normal, and boosts other treatments effects (herbal therapy, homeopathy, surgical therapies etc.). Nowadays, blue Cambrian clay is successfully used in medicine for the cure of various diseases, including cancer, and also widely used in hospitals of Europe (Germany, Sweden…) for T.B. treatment. Blue clay has also been known as one of the oldest cosmetic treatments (for thousands of years), and for its many benefits in a beauty industry, starting from facial masks to full body wraps. The natural healing properties of blue clay help nourish the skin, reducing blemishes, acne and even reducing eczema. It is natural anti-inflammatory and helps to renovate the elasticity of the skin. Clay contains beneficial minerals - kaolin, calcium, phosphate, iron, magnesium and zinc which help to regenerate the skin, maintain its youth and elasticity. Many skincare products, which have been made with the use of Cambrian blue clay - contain just small amount of it. But, if you just spend some time, take the pure Cambrian Blue Clay powder, and simply mix it to a paste with spring water – you will get 100% natural, and highly effective cosmetic, and healing product *MADE BY YOURSELF*. The name of “Cambrian Clay” comes from the earliest Paleozoic period, Cambrian - dating back about 600 million years. At that time, the Russian Lower Cambrian subdivision - Siberia separated from the supercontinent to form an isolated land mass. During this period, early sediment began to form of what is now known as the Cambrian blue clay. Over the 600 million years Siberia shifted, morphed, and eventually became land - locked in the Eurasian continent (*During the Pleistocene epoch, great continental ice sheets scoured and depressed the shield's surface - and the ancient rocks have yielded a rich variety of minerals…). "Leningrad region" - an ecological pearl of the North-West Russia, and has an absolutely unique structure of the subsoil. There is no any other place on the plains of Russia where you can find such a complete set of outputs of ancient rocks (ranging in age from Archaean to the Late Paleozoic). In the basis of the Paleozoic sediments are sandstone and Cambrian blue clay, the age of which is about 600 million years. This isdue to the fact that the Leningrad region lies at the junction of two major structures of the earth’s crust - on the southern edge of the Baltic Shield’s crystalline bedrock and Eastern European Platform. Together they form the East European (Russian) platform - where its Pre-Cambrian folded basement emerges on the surface. According to researches made by Russian scientists, Cambrian blue clay from Leningrad region - is considerd to be the oldest blue clay on the Planet! - is 100% natural, high quality product sourced from the clear plains of the Leningrad region (which lies within the ecoregion of Scandinavian and Russian taiga). This clay contains all essential mineral salts, micro - and macroelements our body needs for health: silica, iron, potassium, phosphates, calcium, magnesium, nitrogen (Si, Al, K, Fe3+, Fe2+, Mg, Na, Ti, Ca, S, C, etc.) - in a form that our body can absorb easily. *Our Cambrian Blue Clay is extracted from depths of more than 80 meters. *Clay has been cleaned, processed to Fine Powder - and packed in high quality plastic bags with zipper lock. *Package weight: 2,5 kg., or ~5 lb. Increases blood circulation and lymph drainage. Provides supply of essential minerals, vitamins, organic acids and anti-oxidants through the skin due to its well-known ability to absorb substances. Anti-inflammatory and anti-bacterial properties improve skin conditions like psoriasis, eczema and dermatitis. Improves the skin appearance and texture, smooth out wrinkles, treats acne and pimples, removes freckles. Eliminates the dead cells of the outer skin layer, and reduce the appearance of blood vessels. Stimulates the growth of skin cells and collagen. Stops gums bleeding (when a paste of clay and water is rubbed into them. You can also whiten teeth with the same mixture). Promotes removal of oils and impurities from the skin, clearing out pores. Draws impurities out of the body (detoxifying effect). Boosts the immune system. Speeds up body metabolism. Boosts hair growth (if hair is rinsed with clay water). Increases removal of toxic waste and reduction in the cellulite appearance. Removes excessive water from the body reducing puffiness. Promotes weight loss due to the effects listed above. Relaxes the body and mind and increase the sense of well-being. Acts as a powerful antiseptic and antibiotic, balances the human bio-field, is safe to use for everybody, and does not cause allergic reactions. Used in a general bath or a foot bath, cambrian blue clay acts as a very effective detoxifying remedy (*For best results, internal Cambrian clay use is recommended at the same time). Ulcers and infected wounds benefit most from cambrian clay applications. 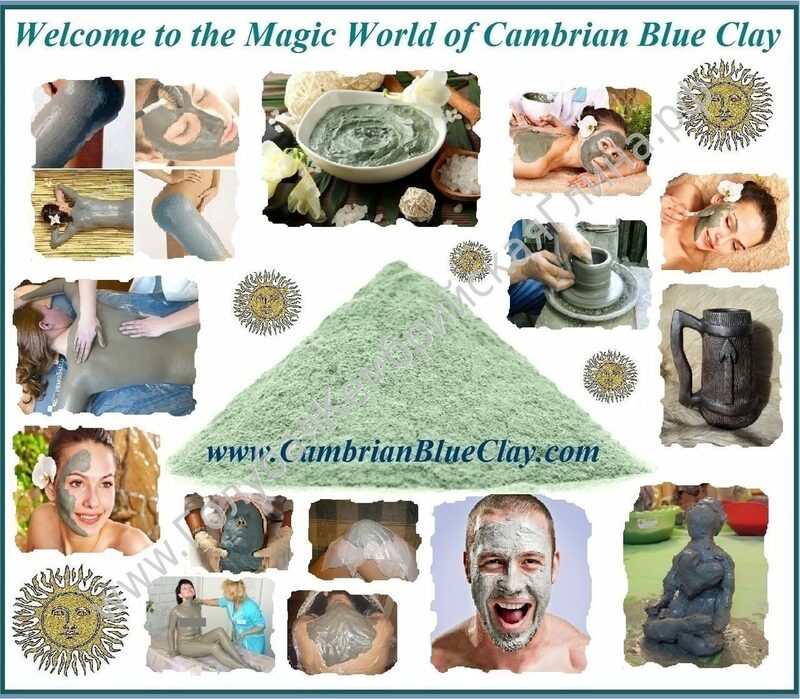 Used in an enema/colonic irrigation procedures, Cambrian blue clay is simply the best colon cleanser available to us. Used as a vaginal douche, it can help with many problems including candida and minor infections. Used over hemorrhoids, cambrian clay helps heal them quickly. Cambrian clay compresses are a First Aid remedy against bruises, sprains, strains (cold clay compresses will relieve the pain and internal bleeding and facilitate healing). Used over burns /sunburn, cold Cambrian clay compresses are the fastest healing and pain relieving remedy which helps regeneration of tissue and prevents formation of scars. Carrot, beet, summer radish and potato don’t rot during winter, if they are placed into a jar with Cambrian blue clay for a few minutes. cancer, leukemia, adenoids, polyps, goiter, lymph nodes inflammation, anemia, headache, atherosclerosis, paralyses, nerve disorders, epilepsy, brain disturbances, eye inflammations, women’s diseases (mastitis, mastopathy, prolapsus of the uterus, fibromyoma, cysts, irregular periods, virginities, different discharges), men’s impotence and testicles indurations, diabetes, digestion disorders (gastritis, constipation, intestinal colic, piles), inflammation of the liver, jaundice, nephritis, urinary bladder diseases, heart disorders, bronchitis, pneumonia, pleurisy, T.B., cough, blood spitting, rhinitis, sore throat, skin diseases (eczema, psoriasis, erysipelas, warts), alopecia, arthritis, rheumatics, spurs, injuries, varicose veins, bones and joints diseases, ulcers and so on. For external applications Cambrian blue clay can be used in facial masks, baths, compresses, poultices, body wraps, powder applications to weeping ulcers, nappy rash, weeping eczema, fungal infections. It can also be used as an ingredient for other cosmetic products - in spas, resorts, naturopathy clinics and at home. In the cosmetics industry blue clay is used in soaps, toothpastes, face / body packs (…and other clay-based products which are beginning to win the consumer over). Mix 3 - 4 tsp of blue clay with clean water to form a smooth, spreadable paste (using approximately 40% - 50% water). Spread evenly over the face and leave to dry (for ~ 20 minutes). Remove / wash off with warm water. Use your moisturizer to nourish the skin afterwards. Clay masks can have other ingredients added, depending on the skin type and purpose of the mask. Since Cambrian blue clay is a great detoxifier, they leave the skin cleansed, pink, fresh and revitalized, generally looking younger. Fill the bathtub 1/3 deep with worm water (t 37-38°C), take from 100 g. to ~1 lb (500g.) of cambrian blue clay and mix it in bath water. Let the Cambrian clay hydrate for 5 -10 minutes. Then, fill your bathtub with just enough water to fully submerge the body. Stir the water before getting into the bath (*You can add 250g of magnesium chloride flake for a better detoxifying and healing effect). Start by staying in the bath for 10-15 minutes. Increase gradually up to 30-40 minutes within 7-10 days. In order to make a compress, mix some cambrian blue clay with clean water to make it quite runny. Spread over a piece of cloth (0,5 - 2cm thick). Apply on an affected area. Cover with a compress paper, wrap up in a warm cloth. Leave on until the clay dries out (~40min. – 1 hour). Apply on aching joints, muscles, in the area of organs affected by an illness. A poultice has a much more powerful effect than a compress, since it requires a lot more clay per application (1 - 3cm thick), and it works as a mass, drawing up toxic waste into itself. The electromagnetic charge is stronger too. So, the overall effect is more powerful. It is especially good for applications on an affected area, or simply where a stronger action is required. Apply a warm poultice over the area, cover with grease-proof paper and a warm cloth. If an area is hot and inflamed, a cold poultice application is recommended to relieve the heat and reduce the inflammation. Body wrap - is a luxurious and thoroughly therapeutic treatment, especially with powdered seaweed added to it. Mix the cambrian blue clay with seaweed powder (50/50), add water to form a spreadable mass. To do it at home, prepare a place to lie on first, and a warm room. Lay down 1 or 2 warm blankets, with a plastic sheet on top. Cover yourself with the mixture of clay and water, or clay, seaweed and water, lie down on the plastic sheet, cover yourself with the remaining half of the blanket. Make sure you remain warm throughout. Stay under the blanket for 30 - 45 minutes. Wash off in a shower or a bath. For a salon application, follow the normal procedure for a body wrap. Mix Cambrian blue clay (~3 table spoons) with clean warm water and fine sea salt (~1 table spoon) to make a facial pack. Apply daily onto affected area. It can be also used for warts, athlete’s foot, yeast fungus, ringworm, sunburns, scalp, pimples, cuts, boils, cold sores and shingles. Mix enough Cambrian blue clay with clean water and warm it up on a water bath. For applications and compresses use Blue Clay mixture at 42 - 45 °C, layer thickness 1 - 1,5 cm. Duration of procedure: 30 - 90 min. Procedures should be carried out for 1 - 2 days, with a break on the third day. These applications can be useful for the treatment of psoriasis, arthritis, eczema, ulcers, inflammations, aches and pains. Mix Cambrian blue clay with clean warm water to form a semi-liquid paste, spread over a clean cloth and apply to an affected area (normally an area of localized problem, e.g. arthritis, strain, sprain, back problem, etc.). Cover the area with warm cloth and cling film. Leave on for 2 hours or longer, even overnight. Use dry cambrian blue clay powder on weeping eczema, ulcers, Athlete's foot, any sores and wounds which need disinfection and healing. Cambrian blue clay is a great for gums, preventing formation of plaque and treating mouth ulcers. If an inflammation of the gums or a mouth ulcer occurs, take some clay into your mouth and keep it there for a while (10 - 15 minutes). Do not swallow - rinse the mouth with warm water. Repeat the procedure frequently, until the inflammation goes away. Cambrian Blue Clay should be discharged straight after treatment and must not be re-used! In order to stay healthy, first of all - we have to nourish our body with a complete spectrum of the kinds of foods that it will recognize as a “Real food”. Real food - is that which is compatible with the organic nature of the body's original construction. The human body is a natural organism - it was created from the "dust (or clay) of the earth". Therefore, the perfect food for the body will also be of earthen origin - unaltered. Earthen resources that qualify as real food include such things as: clay, water, algae, seaweeds, herbs, fruits, nuts, seeds, and vegetables… Anything less than whole would not be a "real food". This includes "natural" vitamin and mineral supplements assembled by a laboratory rather than by Nature. Second of all, it is our job - to provide the body with an abundance of “Real food”, and let the body to construct its own medicine. It is also our job not to toxify the body with foods that are not real, or not compatible with the body - and to detoxify all that is foreign and poisonous. In this manner, the body will have the greatest freedom to select from the vast array of resources that we provide, in order to simply clean *the house* and build life-giving strength. And, this entire process is performed, not by our manipulation of chemical reactions, but through our support of the body's own inherent wisdom. We are about to bring our Cambrian blue clay to North America. If you have any questions, or need any additional information - please wright, or call us (We speak English). "Study suggests life sprang from clay"
"Clay's matchmaking could have sparked life"
-...and for sure that was cambrian blue clay. These vesicles also grow and undergo a simple form of division, giving them the properties of primitive cells. Previous work has shown that the same simple mineral can help assemble the genetic material RNA from simpler chemicals. "Interestingly, the clay also gets internalised in the vesicles," says Leslie Orgel, an origin of life expert at the Salk Institute for Biological Sciences in San Diego, California. "So this work is quite nice in that it finds a connection between the mechanism that creates RNA and encloses it in a membrane." The genesis of genetic material and the emergence of cell structure are hot areas of research, but until now the two had not connected. The birth of genetic material was clearly crucial for life to take on its unique abilities to inherit, mutate and evolve. His team also showed the clay could hold RNA and form vesicles at the same time. Fluorescently-labelled RNA attached to the clay ended up assembled into vesicles after the reaction. And the researchers were able to get these "protocells" to divide by forcing them through small holes. This caused them to split into smaller vesicles, with minimal loss of their contents. All information on this website is for informative purposes only. With all respect for everyone's right to choose methods of treatment and remedies, you are strongly advised not to resort to self-diagnosis or self-treatment. Do consult a doctor if you have an undiagnosed condition. If you are on a life-saving medication, please consult your doctor before using clays or any other alternatives.